A map is a visual model of an area. The title of a map is an important feature. The purpose of the title is to tell you what you are looking at. 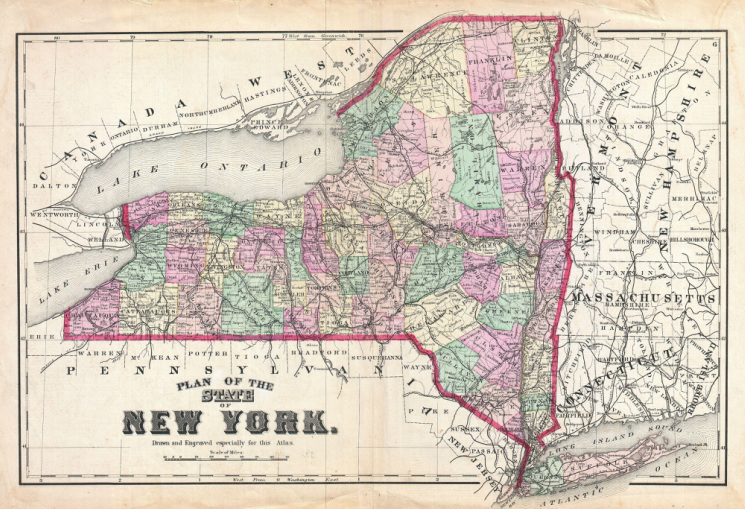 This is a map of the New York state. Would you have recognized it without the title? Orientation: Which direction is north? Now that you are able to tell what your map is all about, you need to learn your way around. The best tool for determining direction on a map is a compass. A compass is an instrument used for determining direction. Compasses come in all different shapes and sizes. However, they all have a point that indicates north. What do those symbols mean!? Now that you have learned what the map is about and how to find your way around using a compass it is time to understand what is found on a map. Maps contain many different symbols that represent landforms and places found on the map. The meaning of these symbols can be found in the key, or legend. The final item concerning map skills is the scale. A map scale is the line at the bottom of the map that allows you to measure accurate distances. It is normally one inch long (though it can vary) and by using it you can get the distance from one map point to another map point. This can be very useful when trying to decide the best route to take on a trip and also to judge the amount of time needed to travel from place to place.